The Genie has now put them right in the middle of a nightmare, though; perhaps this will be his chance to shine. But first, they need to get away from the menacing fire-breathing Godzilla! 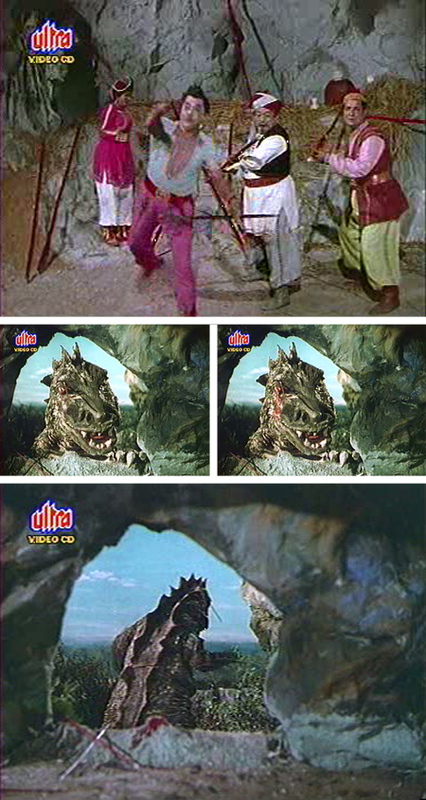 Godzilla chases them up a hill, where they find refuge in a cave which is conveniently stocked with spears. They fend Godzilla off by poking him in the eye. It’s not as fearsome as it could be, though: Godzilla looks kind of cute clinging to the cave entrance, like Gemma when she puts her front paws up on my lap. Plus, the blood flowing from the wound reminds me uncomfortably of tears falling, and I feel sad for the big guy as he mopes away with the spear still stuck in his eye socket. Alibaba draws the short straw, so to speak, when they decide that someone should keep watch in front of the cave entrance while the rest get some shut-eye (at least, that’s my assumption). Alibaba’s patently obvious apprehension is well-founded, too. A pretty girl in a leopard print dress appears and he chases after her—this turns out to be not such a great idea. Alibaba manages to get away despite the girl biting him on the hand (I don’t know why). When he returns to the cave, however, his friends have disappeared and there are more surprises waiting for him in the form of tribesmen with spears and what look like gumdrop-dotted paper party hats. Their leader is our old friend Shyam Kumar! who is still lusting after Jameela, and who really needs to wash his hair. When Jameela refuses him again, he has the whole party tied to stakes—and it’s time for another song. The dancer in this one is really good, but I have no idea who she is. 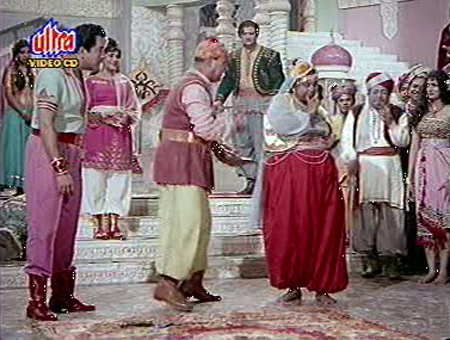 While the tribesmen and Shyam Kumar are distracted, the girl in the leopard print dress reappears and cuts Sinbad, Jameela, Alibaba and Aladin free. 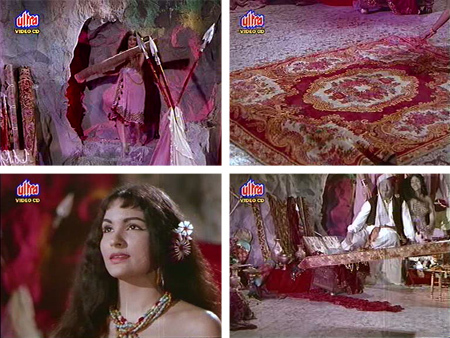 Much swashbuckling follows, and Sinbad finally manages to kill Shyam (although still not with his lovely new sword, which has been left behind in the cave entrance with the lamp). The mysterious girl leads them to a door and utters some magic words (which only sound like gibberish to me). If you don’t want to know the ending, you might want to stop here! But it’s a fairly difficult-to-find film, and I love the cracktastic goodness that keeps on coming right up until the end, so I’m going to keep on. Beyond this magic door lies a cave full of treasure—but our mysterious friend is only interested in a sumptuously patterned carpet. 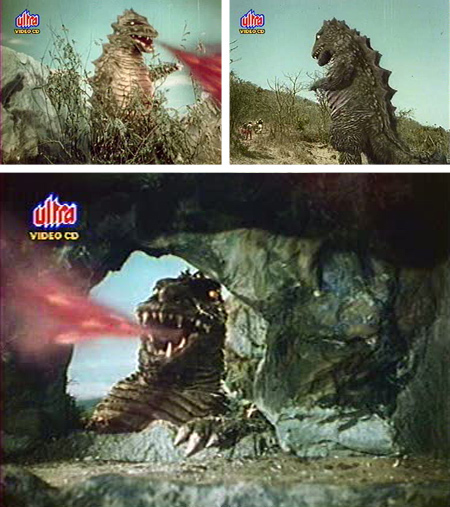 and head home, leaving behind the now one-eyed Godzilla monster, poor guy. At home, the vizier has just usurped the sultan’s throne. The townspeople watch in amazement as our intrepid heroes and heroines fly in, and are greeted with joy by their friends the old man and Rajan Haksar. Quickly apprised of the coup situation, our quintet heads for the palace where the vizier greets them and demands that they hand over their magical treasures. Naturally, they refuse. We finally get to see the sword’s special powers! 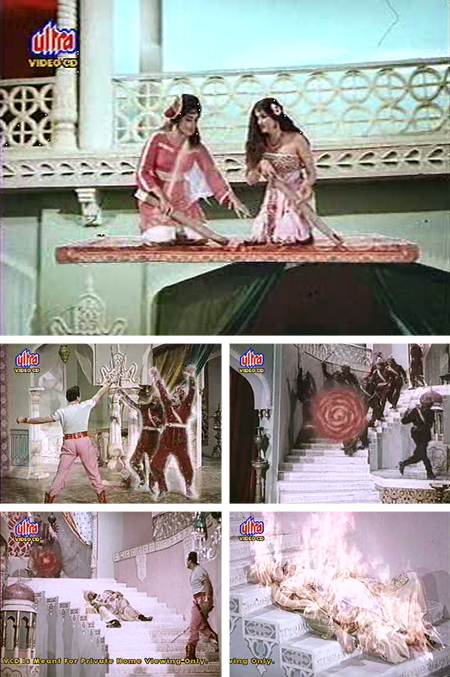 Our heroines fly above the soldiers, bashing them on their heads with poster mailing tubes (or something), while Aladin’s beloved Genie transforms him into a fiery rotary object of some sort. Sinbad smites the Vizier with his sword, and he burns up and vanishes. Now all that’s left is to return the magic sword, lamp and carpet to where they got them (why? I have no idea). 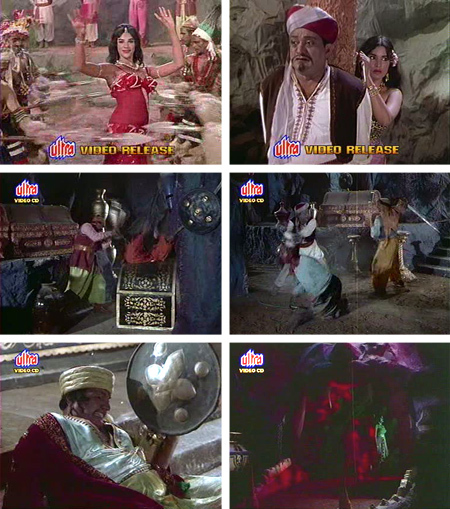 Aladin balks at returning the lamp since it contains Helen, until he summons the Genie again. Tun Tun appears instead! How I love her. She has taken over as Genie, so that Helen can be free to marry Aladin. The carpet carries the sword and lamp off into the sunset. And all’s well that ends well. Even though I had no idea what was going on for the most part, this was oodles and oodles of fun. The songs by Ravi are fabulous (with two Helen dances!) and the special effects remarkably…well, effective. These old “lesser grade” films are so wonderful in my opinion; it’s a shame that they aren’t being restored and subtitled, and packaged and marketed for a wider audience. They may have not been hits in the mid-sixties, but in the first decade of the 21st century—fraught as it is with war, terrorism and recession—I think they are a perfect distraction. Posted on July 31, 2009 at 9:44 am in Hindi movies	| RSS feed You can skip to the end and leave a reply. Greta, your review of this film, plus all the goodness pictured in those screen caps, really made my week! Well, watching the film made mine :-) And I’m happy to share this level of fabulousness! I don’t play video games…I’d rather watch these films or read a book :) I don’t even like watching movies on my computer! Beautiful colors, lovely film (stupid Ultra logo). I think you’re right, all the bright prettiness is a lovely distraction from any woes! Btw, the songs from the movie are on You Tube if anyone wants to see and hear them. I’ve seen quite a few already of these types and have many more in my pile of VCDs to watch. Wish they were on DVD though! 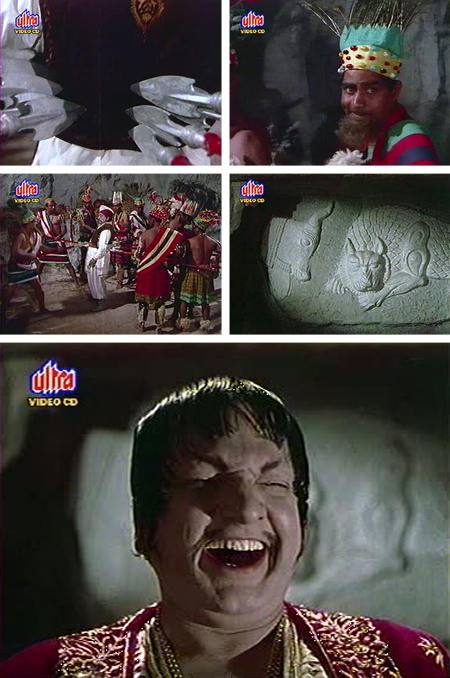 And yes, all the songs are on YouTube (just search Sindbad + Pradeep Kumar and you’ll find them). What a sweetheart of a movie. I am glad you went all the way with the story. I remember seeing Alibaba Marjina (http://www.imdb.com/title/tt0165613/) and was really captivated by all the fun. It had some nice songs too. I have that one too! and the Sanjeev Kumar one from 1966, both on VCD. I should do a series of Alibaba posts. I also have the 1950s one with Mahipal, and Dharmendra’s from 1980 (both with subtitles). Arbaaz Khan did one in the 90s as well. No but I’ve looked it up now and will begin my dogged search. If I find it, you can be sure that I will share it!!! Ooh, Usha Khanna did the music? :-) Looks like fun! So, I must know: Is that second beast some kind of tree monster? I couldn’t quite tell. 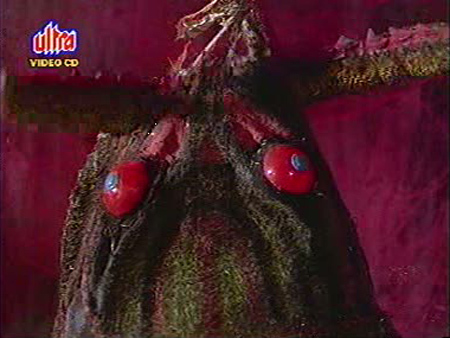 So many of tree monsters in these old Indian fantasy films. I don’t know if that’s a result of the influence of The Wizard of Oz or From Hell It Came. Judging from the cobwebs and the short glimpse of the body as it dropped, I’d say it was supposed to be a spider of some kind (although maybe a tree spider?). That one shot of its face was all we got, and it was pretty short too. Alibaba hightailed it out of there, and I don’t blame him one bit. This film sounds awesome. And with all the screen caps you’ve taken, you could create a cartoon strip out of it – give the Comic Project competition! I thought of that too :) It is quite fab. And yes—these comic book style posts are very handy when you have no idea what’s going on. I am too lazy to add bubbles with possible dialogues though. Someone really funny would have to do that! In spite of stupid ultra logo, it’s been 3 days of fun looking at the screencaps and reading the narration. I see that the predominant colour is pink!!! Pradeep Kumar in pink trousers, then there are his companions in pink long tops. The flying carpet is an excellent addition to the whole thing. Has a very good design too, from what I could make out from the screencap. You are more than welcome :-) Pink, Helen, flying carpets, Godzilla, miniature Baghdad-like city…it’s all good. Arabian nights plus Zorro plus Godzilla et etc !! I agree that a movie like this which sank without a trace in 1960s is perfect entertainment for the present age. Or may be we fee that way, since you have us sold on this genre of movies. The movie makers should certainly pay you for running the most effective campaign for these movies. Helen retiring from the job of being a genie to enter matrimony, and Tuntun succeeding her as the genie- what a brainwave from the makers of this movie. Sheer genius ! It seriously is!!!! I jumped up and down and clapped my hands in sheer joy when Tun Tun appeared. She is so hilarious in everything she does. Love her. Reading all three parts, I can only marvel at how the stories of Sinbad, Alibaba and Aladin have somehow been woven together into this fantastic fantasy. And looking at the screen caps, it looks like the director/producer have given it their everything. Would be great to see this movie – thanks for the excellent reviews, Greta. Like we have discussed before, these so-called “B” movies are often way more paisa-vasool (you know what that means, right ?) and fun than many so-called “A” movies with big stars. This is most definitely paisa-vasool!!! :-) They did give it their all, and it shows. And thanks for the recommendation re: Manmauji—I have that, and will try to see it soon! yesterday I got hold of some rare VCDs of movies where Ganesh was the music director. I have been watching them . I am through with “smuggler” (1966). This is a movie that you will love. 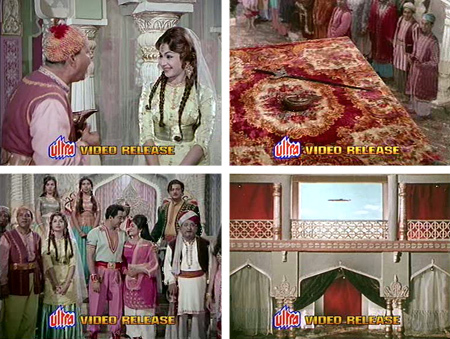 It is a so called “B” grade movie starring Sheikh Mukhtar, Sanjeev Kumar, Kumkum, Helen etc. This is the kind of movie that was looked down upon in 1960s, but which had become mainstream movie in 1970s. 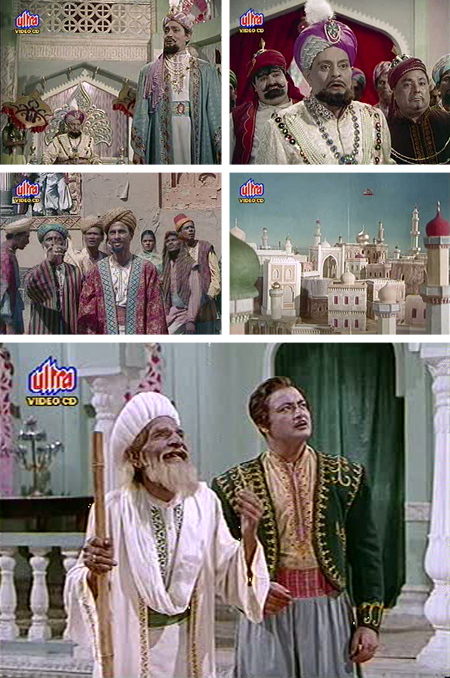 I loved Sheikh Mukhtar, with a Dara Singh like physique who plays an honest police inspector. This movie uses Helen well. she has a cabarat song as well as a mujra song in this movie. 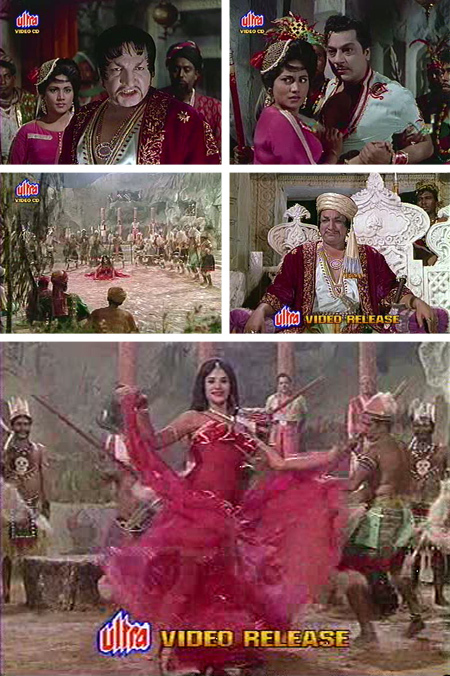 Cabarat song is sung by Lata ( it must be the earliest cabarat song sung by her) and the mujra song is sung by Asha Bhonsle). The music is composed by my favourite music director Ganesh. I loved watching the movie. I am sure that you, a Dara Singh and Mahendra Sandhu fan will enjoy watching this movie which is surprisingly well made for a C grade movie. Incidentally, I managed to land two more movies with music by Ganesh. As if that was not enough, I managed to get a VCD of Sinbad Alibaba Aladin too. I would love to see your review of “Smuggler”, if you have not done it already. Where did you get them? I have not seen Smuggler, and it’s not available at Induna (out of stock). It’s an Aspi Irani film—I have gotten all the ones directed by him that they had in stock, but there were several unavailable ones. He made some amazing films. And this film is very hard to come by—you are lucky you found it! My copy of it is damaged and skips in places too. It needs to be put on DVD with subtitles. Sigh. If you can make do with an untitled copy, then I will unload it. Mind you, I am a novice in uploading. Let me first find out how it is done. I remember started seeing this movie when it was shown on local channel. But could not watch it till the end. Your review told me what I missed. Now I will like watch it in full. 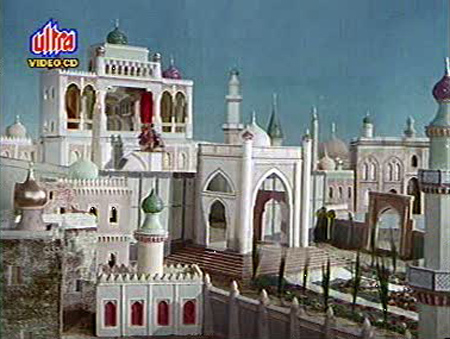 hello, i saw the film “sinbad, alibaba and aladin” (1965) and liked it. i would like to get a vcd or dvd from this film, if possible subtitled in english. Il live in the united arab emirates (abu dhabi). Is it possible to get a copy of this film ? if yes how much shippin include ? i have bought this film, last month . the brand of the vcd is Kamal video. Unfortunatly, the picture is not good if not horrible. Do you know if it is possible to get this film with a good picture, subtitled or not ,in vcd or dvd ? 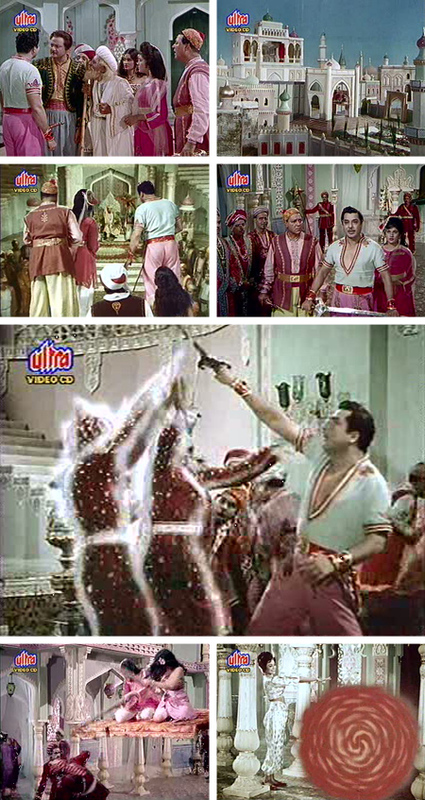 Is “ultra video”better than” kamal video” about the picture ? and where could i get it ? the quality of your screenshots is very good if you compare with the kamal version that you can find for 1 dollar at linux bazaar on internet. i wil try to find the ultra version but unfortunatly i am afraid that this title was pulled out from their catalogue many months ago.Anyway the best thing for this film will be a restored version in dvd with a good quality picture subtitled in english. I saw this film in France, many years ago. Please, do you know if now it is possible to get a good picture quality of the film ‘Sinbad, alibaba and Aladin’ with subtitles in english if possibility. I know I am too very late to comment in this article, but I would love to buy a copy of this movie for myself. Greta, could you please spare me the website where the version you bought is on sale? There’s another retail version which has the worst copy of the film, and I don’t think we can even figure out who’s who.